AV1804 set includes all 3 versions of our series of 1mm Offset Insert Bushings to allow for a new range of tuning using your kit supplied suspension mounts or the GHEA optional mounts. 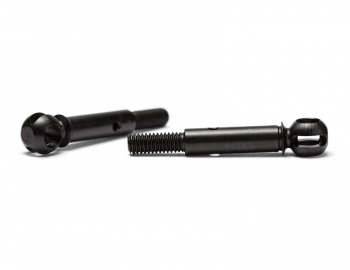 Avid is offering all three of the stock AE inserts locations (1 Dot, 2 Dot, and 3 Dot) but with the hole 1mm lower (Look at image below that shows the stock black 1 Dot insert on the right and our 1 Dot 1mm Offset insert on the left). 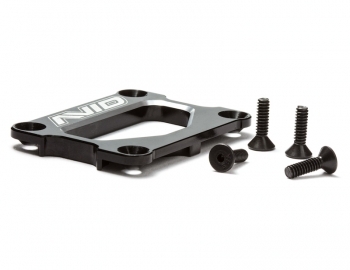 After countless hours of testing, the AVID team is offering up this simple solution to allow racers to customize their suspension to get lower or higher roll centres, as well as being able to move all of the other pivots on the chassis. The combinations are practically endless, and as we find out new setups they will be posted on this product page. 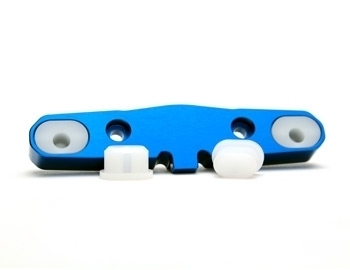 By using this 1mm Offset Insert Bushing (1 Dot) in the D plate of the RC8.2 with the hinge-pin hole in the lower position (closet to ground), you are lowering your roll centre which will increase rear traction. A common setup trend on the RC8.2 is to run more rear toe by running 2 or even 3 Dot out. By running our offset insert you may run less toe while still maintaining the same level of confidence you had when you ran 4 - 5 degrees. The benefit comes into play with more control of your car in the turn due to less toe angle fighting the inconsistency of the track surface. And even though more rear toe gives more rear bite it does cause the car to initially respond very quickly while entering a turn before the chassis roll has begun which can get you into trouble sometimes. (blue aluminium plate not included).